The server can power on and run POST (based on the other parameter settings). This parameter overrides all other commands. The server runs POST based on predetermined settings. The server cannot power on. The server can power on and run POST, but no flash updates can be made. POST runs according to diag level value. 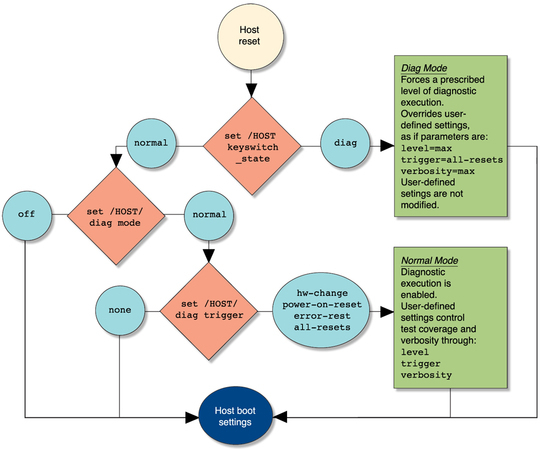 If diag mode=normal, runs all the minimum tests plus extensive processor and memory tests. If diag mode=normal, runs minimum set of tests. (default) — Runs POST following a FRU replacement or an AC power cycle. Runs POST on all resets. Runs POST on all error resets. Runs POST on every power on. Runs the maximum set of tests. Runs the minimum set of tests. (default) — Displays the minimum level of output. Displays information for each step. Displays a moderate amount of information, including component names and test results. (default) — Runs the maximum set of tests. Runs a minimum set of tests. Displays all test and informational messages in POST output. Displays functional tests with a banner and pinwheel in POST output. Displays all test, informational, and some debugging messages in POST output. Does not display POST output. The following flowchart illustrates the same set of Oracle ILOM set command variables as listed in the table above.